Jinan, the capital city of China’s Shandong province, opened on Thursday a kilometer-long stretch of solar expressway for testing, joining France and the Netherlands that have tapped into the nascent technology. 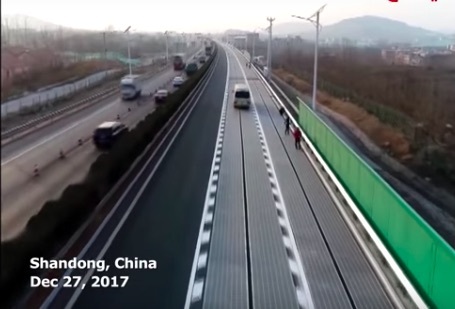 China’s new solar road consists of an insulating layer on the bottom, photovoltaic panels in the middle, and transparent concrete on top. The solar panels cover 5,875 square meters and can generate 1 million kilowatt-hours of power in a year, or enough to meet the energy demands of about 800 homes, Qilu Transportation Development Group, the project developer, claimed. If the technology proves effective, the electricity generated by the panels could power everything from street lights to signboards, and even a snow-melting system on the road. Excess energy can get sent to state grid. But this special road—which China has hailed as the “world’s first photovoltaic highway“—is designed to do a lot more than just harness the sun’s rays for electricity and allow cars to get from A to B. The site also serves as a clean energy lab to test other technologies, including wireless charging for electric vehicles and providing internet connection. As intriguing as the project sounds, solar roads have been dismissed by critics as too expensive for practical use. China’s road costs about $458 per square meter, which is much more expensive than, say, traditional asphalt. Still, this project showcases China’s multibillion dollar plow into renewable energy. By 2020, the country is aiming to build 54.5GW of large-scale solar projects. “With the development of solar power in China, the cost can be further reduced,” Xu said.